The Aker 132A White Lightning is a lightweight, versatile and comfortable holster that fits a wide range of popular semi-automatic pistols. It is made from premium cowhide leather and available in black or tan, making it tough, wear-resistant and safe for your firearm's finish. Each one is custom molded to your choice of firearm for a precise and secure fit, and includes an open muzzle to accommodate a variety of barrel lengths. The top is also open to provide unrestricted access to your firearm, speeding up your draw and reaction time. The dual belt slots are set wide apart, providing a stable and close fit. My 45 goverment fits the holster just right, Had a different holster like this years ago, but this one is much better and molded for the Pistol.. Very happy with it. 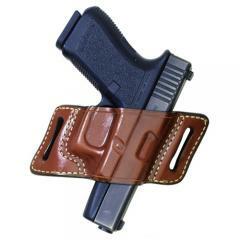 Excellent holster especially with a cover shirt and can clear it easier and faster than a snap-in type holster.